Density-based clustering uses the idea of density reachability and density connectivity (as an alternative to distance measurement), which makes it very useful in discovering a cluster in nonlinear shapes. This method finds an area with a higher density than the remaining area. One of the most famous methods is Density-Based Spatial Clustering of Applications with Noise (DBSCAN). It uses the concept of density reachability and density connectivity. Density reachability. A point p is said to be density reachable from a point q if point p is within e distance from point q and q has sufficient number of points in its neighbors which are within distance e.
Density connectivity. A point p and q are said to be density connected if there exist a point r which has sufficient number of points in its neighbors and both the points p and q are within the e distance. This is chaining process. So, if q is neighbor of r, r is neighbor of s, s is neighbor of t which in turn is neighbor of p implies that q is neighbor of p.
The Density-based clustering algorithm DBSCAN is a fundamental data clustering technique for finding arbitrary shape clusters as well as for detecting outliers. Unlike K-Means, DBSCAN does not require the number of clusters as a parameter. Rather it infers the number of clusters based on the data, and it can discover clusters of arbitrary shape (for comparison, K-Means usually discovers spherical clusters). 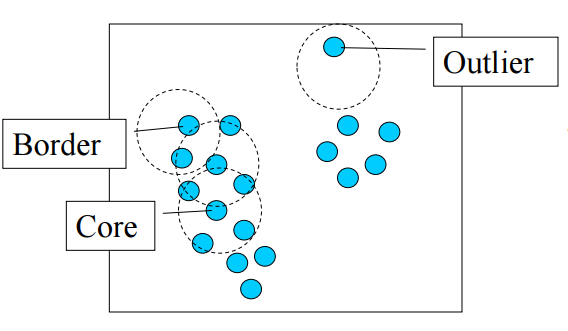 Partitioning methods (K-means, PAM clustering) and hierarchical clustering are suitable for finding spherical-shaped clusters or convex clusters. In other words, they work well for compact and well separated clusters. Moreover, they are also severely affected by the presence of noise and outliers in the data. No assumption on the number of clusters. The number of clusters is often unknown in advance. Furthermore, in an evolving data stream, the number of natural clusters is often changing. Discovery of clusters with arbitrary shape. This is very important for many data stream applications. Ability to handle outliers (resistant to noise). Sensitive to parameters i.e. hard to determine the correct set of parameters. The quality of DBSCAN depends on the distance measure. DBSCAN cannot cluster data sets well with large differences in densities. e (eps) is the radius of our neighborhoods around a data point p.
minPts is the minimum number of data points we want in a neighborhood to define a cluster. One limitation of DBSCAN is that it is sensitive to the choice of e, in particular if clusters have different densities. If e is too small, sparser clusters will be defined as noise. If e is too large, denser clusters may be merged together. Core points. A point p is a core point if at least minPts points are within distance l (l is the maximum radius of the neighborhood from p) of it (including p). Border points. A point q is border from p if there is a path p1, ..., pn with p1 = p and pn = q, where each pi+1 is directly reachable from pi (all the points on the path must be core points, with the possible exception of q). Outliers. All points not reachable from any other point are outliers. Pick at random a point which is not assigned to a cluster and calculate its neighborhood. If, in the neighborhood, this point has minPts then make a cluster around that; otherwise, mark it as outlier. Once you find all the core points, start expanding that to include border points. Repeat these steps until all the points are either assigned to a cluster or to an outlier. In the following part, we will demonstrate how to use DBSCAN to perform density-based clustering. Determing optimal value of e (eps). First of all, we should define the optimal value of e. The method proposed here consists of computing the he k-nearest neighbor distances in a matrix of points. The idea is to calculate, the average of the distances of every point to its k nearest neighbors. The value of k will be specified by the user and corresponds to MinPts. Next, these k-distances are plotted in an ascending order. The aim is to determine the knee” which corresponds to the optimal e parameter. A knee corresponds to a threshold where a sharp change occurs along the k-distance curve. 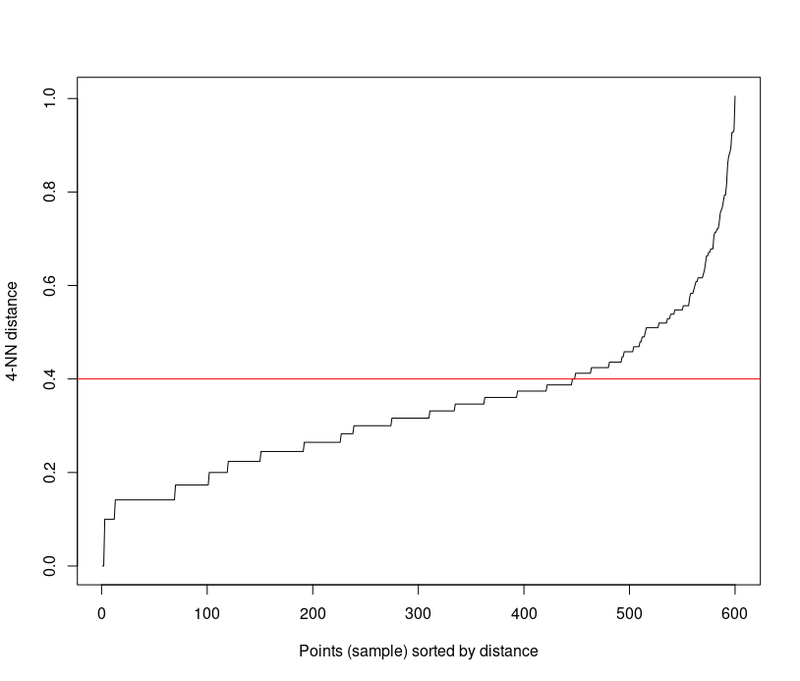 The function kNNdistplot() can be used to draw the k-distance plot. It can be seen that the optimal e value is around a distance of 0.4. The result shows DBSCAN has found four clusters and assigned 25 cases as noise/outliers. 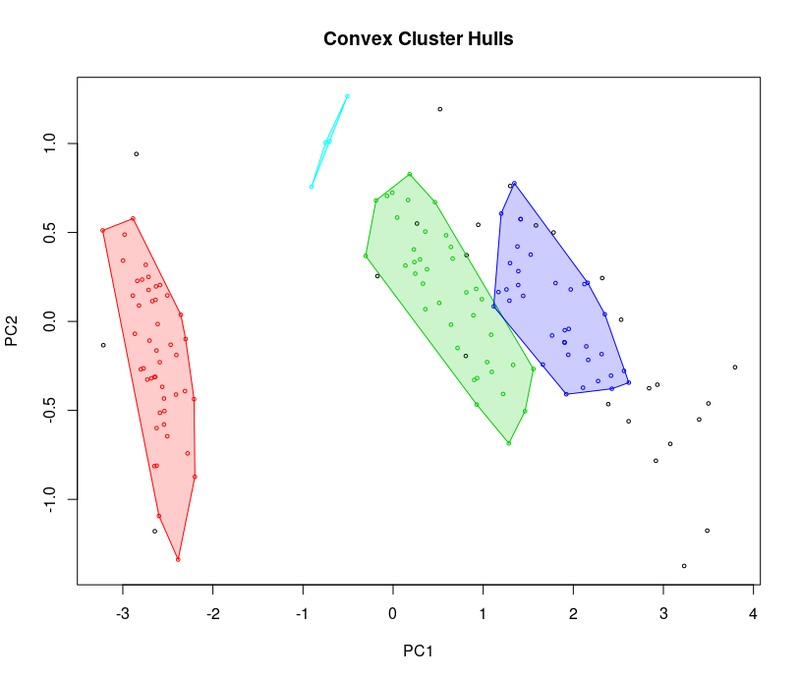 The hull plot shows the separation is good, so we can play around with the parameters to get more generalized or specialized clusters. Black points are outliers. You can play with e (neighborhood size) and MinPts (minimum of points needed for core cluster).